Why do you feel pain during sugaring? Home » BLOG » Why do you feel pain during sugaring? What determines the level of pain during epilation? The same procedure can cause a different level of pain. What does it depend on? It turns out that there are many factors. Let’s look at them. Each person has a different pain threshold, their nerve cells react to pain differently. It can be high, medium or low. The lower it is, the more pain is felt. The pain threshold may increase with regular pain sensations, as well as in people who exercise, experience constant physical activity. And on the contrary, the pain threshold decreases in the period of depression, exhaustion or sickness. It is believed that women have a higher pain threshold than men. If you do the epilation regularly, the pain threshold will inevitably increase. Nerve endings get exposed, the upper layer of the skin is damaged. The least painful epilation method is sugaring. 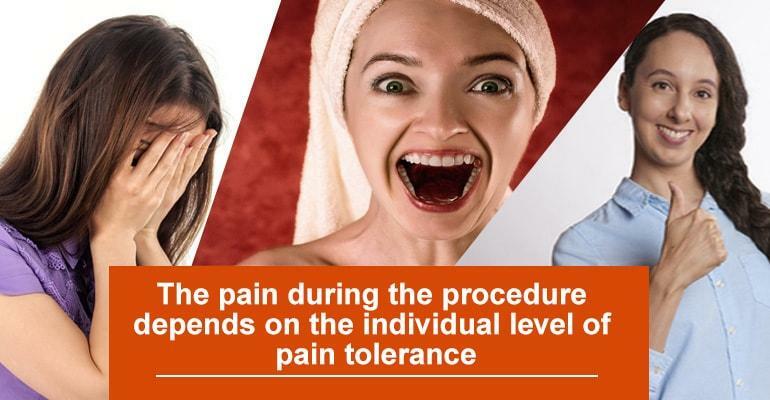 The level of pain depends on the psychological mood a lot. If the client is very worried and has the sugaring procedure for the first time – the stronger the fear, the higher the sensitivity. If a person suffers from insomnia, experiences anxiety, is tired or hungry, she or he can feel more pain. The first week after menstruation, the pain threshold is higher. During menstruation, it is very low, so it is better not to plan epilation for these days. The favorable time of day – from 15.00 to 18.00. People with healthy lifestyle have higher pain threshold. Ones who don’t eat right, have excess weight, smoke and drink alcohol often usually have lower pain threshold. Exacerbation of chronic diseases of kidneys, liver, circulatory system, stomach, intestines can lead to edemas which increase pain. Comfort of the client depends a lot on practitioner. If we speak about sugaring, it is important to correctly apply and tear off the paste. Waxing is more painful than sugaring. The same can be said about other methods (laser, photo-, electro-epilation), some of them can even cause burns. How to reduce the pain? An hour before the procedure, you can take painkillers (Ibuprofen, Excedrin). You also can apply numbing spray on the area to be treated. Choose days in the first decade after menstruation for the sugaring procedures, lead a healthy lifestyle, and a hair removal will not be accompanied by severe pain! In addition, tune in to the procedure, persuade yourself that it will make you more beautiful! Do the hair removal procedures regularly and choose the gentlest of all the methods – sugaring!